Good Morning friends, Hope you are enjoying your weekend. 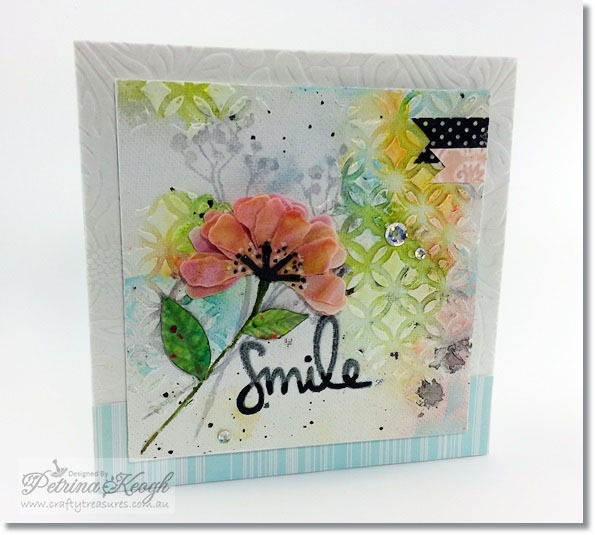 Today’s project’s I made for a recent Splitcoast Stampers challenge ways to use it – watercolour backgrounds. 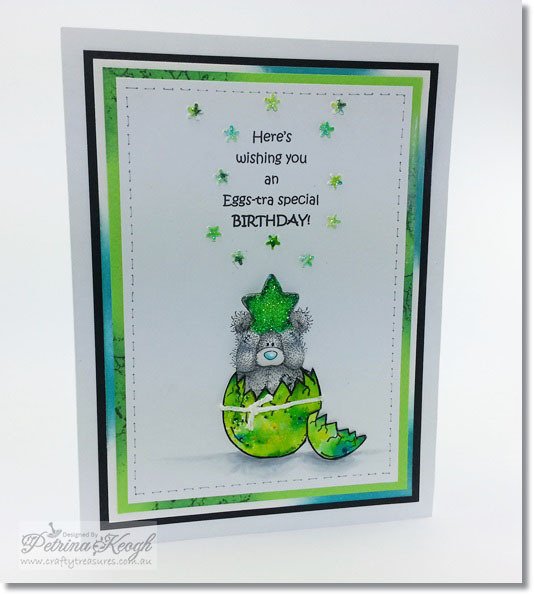 Remember my previous post Faux Brushos with Crushos and those super fun results with the watercolour backgrounds, today I will show you how I utilized some of those backgrounds to create some fun cards. For this card I used one of my newer dies from Susan’s Garden and a new Kaisercraft Quarters template. I played with some texture paste on a piece of 100% primed cotton canvas and some watercolours to create a background layer. This layer was still quite floppy and I wanted to mount this on 3D foam adhesive, so I simply strengthened it by adhering a piece of stiff cardboard to the back. I stamped some leafy stems and die cut 3 flowers from the watercolour backgrounds (the baby wipes), folded them in half and adhered the Calyx: Sepal to it (cut from black cardstock) and stippled some Anther (tiny black and white dots) around it. To finish the flower I cut two sized leaves from a different colour watercolour background. The sentiment looked a little fuzzy when I stamped it, because of the texture from the canvas but I actually don’t mind how it turned out. I deepened the bottom half of the sentiment with a black marker. I used some beautiful embossed flocked paper (I’m fairly certain it’s Christine Re – specialty paper) and a piece of scrap designer paper for the base. Using the masking technique with the egg stamp and the Tatty Teddy image onto white cardstock, I shaded ted with copic markers. I embellished above the tatty teddy image with what look like tiny stars, they are actually the stamen from a Susan’s Garden die set. I cut the stamen die from the same piece of watercolour background and adhered them onto the card. The sentiment was printed on a pc. I embellished the star with 2 shades of glitter. Love, Love, LOVE the first one, absolutely gorgeous work of art!! The second is lovely as well. Great post and work!